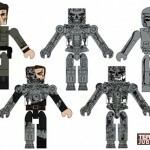 Art Asylum has revealed some new in-package photos of the Terminator 2 Series 2 Minimates. 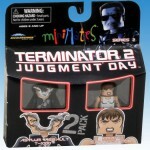 Art Asylum has posted images of the upcoming Previews exclusive Minimates Terminator 2 2-pack. The 2-pack includes the Biker T-800 and Kyle Reese. We had previously reported on other T2 Minimates Here. 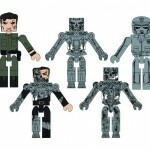 Check out the in package Terminator 2 Minimates by clicking the headline of the story. 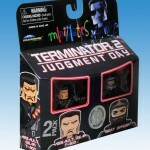 You can see multiple images of each Terminator 2 Minimates 2-Pack by clicking the headline of the story. 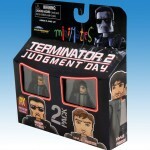 Diamond Select Toys has updated their website with new info on their line of Terminator 2 toys, including the Minimates. Diamond Select Toys & Collectibles, LLC and The Licensing Group LTD, today announce a partnership to design and produce new collectibles based on the action-packed Terminator franchise, specifically Minimates and Ultimate Quarter Scale figures featuring characters from the blockbuster Terminator 2: Judgment Day! 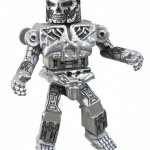 The Diamond Select Toys (DST) Terminator 2 lines will debut this spring just in time for the worldwide debut of Terminator 4, the latest big-screen installment in the Terminator franchise – which ranks amongst the best box office bets of all time. The Terminator 2 Ultimate Quarter Scale figures will include cloth outfits and accessories from various scenes as well as internal electronics featuring sound clips from the Terminator’s epic adventures. In addition, Art Asylum has designed several lines of collectibles Terminator 2 Minimates which will begin arriving in stores this May. An assortment of two-packs will be available in specialty comic book stores and a complementary assortment will also be available in Toys R Us. Both assortments will include the T-800 & Endoskeleton and the Final Battle T-800 & Final Battle T-1000 two-packs, with comic stores receiving the exclusive Biker T-800 & Kyle Reese while Toys R Us offers their exclusive Assault Gear T-800 & SWAT Officer. The previously announced John Connor, Sarah Connor and Flashback Terminator will be available in future waves rather than being included in Series 1 as originally indicated. Internet retailer Action Figure Xpress will round out the Minimate cast with an exclusive T2 Cyberdyne Assault Minimates box set featuring even more characters from the celebrated film. That set will be exclusively available for $20 at this summer’s San Diego Comic Con, beginning on July 22nd, and will be limited to 2,000 pieces. Diamond Select Toys expects the first Terminator 2 products to be available this May. For more product announcements and to browse other science-fiction, television and film collectibles, please visit www.diamondselecttoys.com and www.artasylum.com. 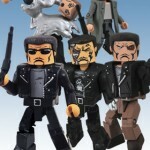 You can see an additional image of the Terminator 2 Minimates by clicking the headline of the story. You can see all of the images by clicking the headline of the story. Click the thumbnail to check out the concept art for the figures. A Diamond Select Release! Art Asylum Designs & Sculpts! “Judgment Day” is here and it’s never been cuter! Featuring the Terminator franchise’s Minimates debut, this new series of individually-packaged Terminators is perfect for creating the ultimate unstoppable Minimate army! Includes one each of the following: Terminator, Battle-Damaged Terminator, Standard Endoskeleton, Battle-Damaged Endoskeleton, Scorched Endoskeleton and Half-Human Endoskeleton!